By clicking on the settings icon at the top right of the Z1 Server screen you can access the settings dialog. The options within the Buttons tab are explained here. The Z1 Server can transmit button presses from your wheel or button box across your network to the Z1 Dashboard. To do so you need to assign the desired buttons to the Z1 Server as explained below. This can be either Yes or No. When set to Yes the app will check for button presses. Note that if you change the setting you will need to restart the software for the change to take effect. This can be either Yes or No. When set to Yes the app will check for device number as well as the button number to determine if a button was clicked. If you have multiple identical devices, such as button boxes, then turning this option on will allow the software to differentiate between those boxes. This can be either Yes or No. When set to Yes the app will check for POV inputs, such as hat switches. 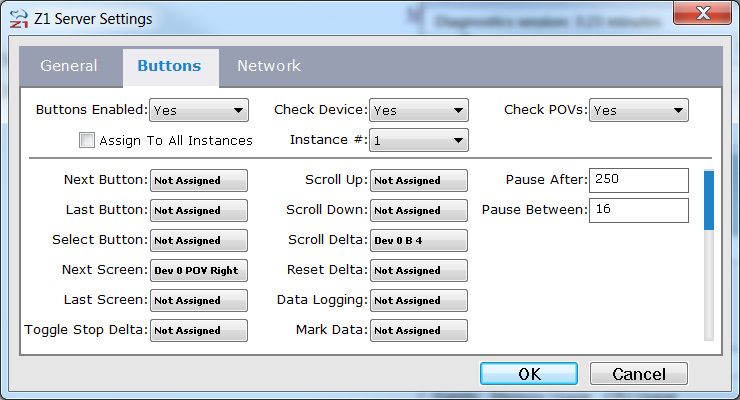 When this is checked the button inputs will be broadcast to all connected instances of the Z1 Dashboard. If you want the inputs to be sent only to a specific instance then uncheck this box. If you have unchecked the Assign To All Instances checkbox then you will need to specify which instance these buttons definitions should be sent to. You can choose the instance number (1-6) from this drop down. Each instance can have a different set of buttons assigned to it. This allows you to control up to 6 connected instances of the Z1 Dashboard using different button inputs. This is the button assignment to highlight the next button in the sequence of displayed buttons on a particular screen. Click the S icon to its right in order to select the desired button. This is the button assignment to highlight the previous button in the sequence of displayed buttons on a particular screen. Click the S icon to its right in order to select the desired button. This is the button assignment to select the currently highlighted button on a particular screen. Click the S icon to its right in order to select the desired button. This is the button assignment to display the next dashboard associated with the current car. This only works when you are in the car. Click the S icon to its right in order to select the desired button. This is the button assignment to display the previous dashboard associated with the current car. This only works when you are in the car. Click the S icon to its right in order to select the desired button. This allows you to assign a button to turn on or off the 'after stop' display on the track maps. By default the 'after stop' display is show when you get within a specified number of laps of your stop (3 by default). But you may use a button to turn it on or off at any time. This is the button assignment to scroll up any windows that have up/down arrows. Click the S icon to its right in order to select the desired button. This is the button assignment to scroll down any windows that have up/down arrows. Click the S icon to its right in order to select the desired button. This is the button assignment to scroll through the various delta options. This lets you change the displayed delta on the fly. The Dashboard will display a message when you change the currently selected delta. Click the S icon to its right in order to select the desired button. This is the button assignment to reset the current delta. This lets you delete any saved splits for the current car and track combination. This is useful if the weather or other changes in the track require the delta to be reset. The Dashboard will display a message when that the delta has been reset when this button is pressed. Click the S icon to its right in order to select the desired button. This is the button assignment to toggle data logging on and off. You must also set the Data Logging option to Button (in the General tab). Click the S icon to its right in order to select the desired button. This is the button assignment to insert a marker into telemetry files. Once assigned it just requires a single push to place the marker. Holding the button down continually will place multiple markers all in a row. This is the number of milliseconds that the software will wait after receiving a button input before it will accept another input. You can increase of decrease this value to suit your types of buttons. For example if you are using a rotary dial, you might want to software to wait less than if you are using a push button. The default value of 250 gives a fairly good compromise across all button types. This is the number of milliseconds that the software will wait between checking for button inputs. If you find that button inputs are being missed you can try reducing this value. If button inputs are happening too quickly then try a higher value. You can assign a specific button to jump directly to a specific screen number within your car's dashboards. Just assign the appropriate button to the desired screen number. Click the S icon to its right in order to select the desired button. This is the button assignment to add fuel in iRacing. This will add one liter to the amount of fuel that will be added at your next pit stop. Click the S icon to its right in order to select the desired button. This is the button assignment to remove fuel in iRacing. This will remove one liter from the amount of fuel that will be added at your next pit stop. Click the S icon to its right in order to select the desired button. This is the button assignment to add the necessary fuel to finish the race in iRacing. This will add the amount of fuel required to finish the race, plus three liters (as a buffer), at your next pit stop. If this is more than the capacity of the fuel tank then you will get a fuel tank of fuel at the next pit stop. Click the S icon to its right in order to select the desired button. This is the button assignment to tell your pit crew that you do not want to change your tires at the next pit stop. Click the S icon to its right in order to select the desired button. This is the button assignment to tell your pit crew that you wish to have a fast repair at the next pit stop instead of fixing all the damage (if any) that exists on your car. Click the S icon to its right in order to select the desired button. This is the button assignment to tell the Z1 software that you want to add the car ahead of you on track to your watch list. This is the button assignment to tell the Z1 software that you want to add the car behind you on track to your watch list. This is the button assignment to tell the Z1 software that you want to remove the car ahead of you on track from your watch list. This is the button assignment to tell the Z1 software that you want to remove the car behind you on track to your watch list.